Either Sophia Dorothea of Hanover, Queen of Prussia, 1735 (a pommade pot and cover from a toilette service) or Maria Josepha, Queen of Poland, 1738 (a sugar-bowl and cover from a coffee service). Georg Spielgelberg, Hanover; Lepke's, Berlin, 4-5 December 1928, lot ?? (along with ten other pieces from the service). With James A. Lewis & Son, New York. The present bowl and cover is related to a small part service comprising a teapot, cover and stand, a spoon tray, two two-handled small bowls, covers and stands, and a two-handled beaker and cover, from the collection of Siegfried and Lola Kramarsky and sold Christie's, New York, 30 October 1993, lot 31. One two-handled small bowl and cover is now in the Arnhold Collection (1995.319). The second, along with the stand for the first and the remaining pieces from the lot are now in the Melinda and Paul Sullivan Collection. All of these pieces plus the present bowl and cover were previously in collection of George Spiegelberger, sold through auction at Lepke, Berlin, 4-5 December 1928 as part of an eleven-piece part service. Pieces from the original 18th century commission are in the Kunstgewerbemuseum, Berlin (Fürhrer durch die Sammlungen, Kunstgewerbemuseum, Berlin, 1988, p. 97, cat. no. 222). There has been some debate as to whether these pieces were originally part of a toilette service made in 1735 for the queen of Prussia, or part of a coffee service made in 1738 for the queen of Poland. 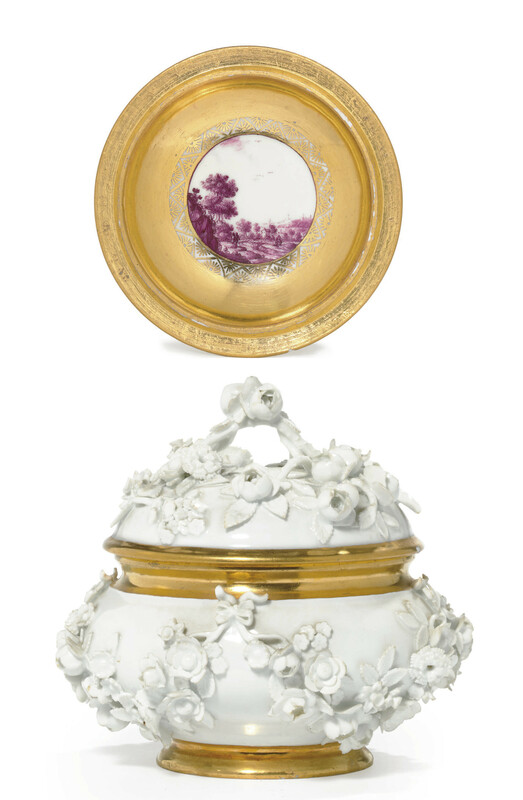 See Maureen Cassidy-Geiger, ed., The Arnhold Collection of Meissen Porcelain, 1710-1760, The Frick Collection & Frick Art Reference Library, Exhibition Catalogue, 25 March - 29 June 2008, cat. no. 256 for a discussion of the Arnhold small bowl and cover and the origin of this elaborately decorated group of wares.